Iranian president Hassan Rouhani said today that nuclear talks between the six major powers and his new government could start on the sidelines of the upcoming UN General Assembly in New York. “Perhaps the talks (with P5+1) on the nuclear file would start in the coming weeks in New York and would continue at a venue that would be chosen later,” Rouhani said. (Mehr News Agency/BBC Farsi, 10 September). Rouhani expressed hope that “successful steps” will be taken during the talks, but reiterated Iran’s position that the country will not give up its rights on the nuclear issue. 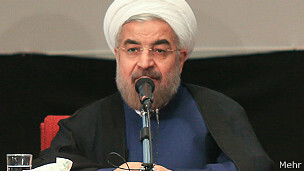 Rouhani made the comments in a conference of Iran’s Friday Imams in Tehran. Earlier today, the newly appointed foreign ministry spokeswoman, Marziyeh Afkham, told reporters in a news conference after being appointed as the first female foreign ministry spokeswoman in the country, that Iranian Foreign Minister Mohammad Javad Zarif and EU Foreign Policy Chief Catherine will meet on 22 September on the sidelines of the UN General Assembly in New York. Afkham had suggested, however, that the upcoming meeting would not be part of the nuclear negotiations between the two sides even though Zarif and Ashton are the chief nuclear negotiators for Iran and P5+1 respectively. Rouhani later reversed that assertion. Last Tuesday, Zarif urged the P5+1 to show political will when negotiating with Iran. “They should create a political will on their side and decide to resolve this issue,” Zarif said. “We hope that we will see this change in the behavior of the G5+1 and the two or three countries which more than others pursue the policy of pressure against Iran, that they want to settle the problem through negotiations,” he added. The two sides wrapped up their latest round of negotiations on April 6 in Almaty, Kazakhstan.